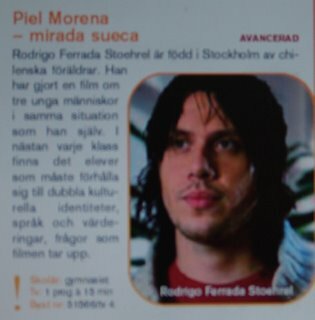 The documentary film "Piel morena Swedish eyes" directed by Rodrigo Ferrada-Noli Stoehrel (shown today anew at the Swedish Television Channel 1) it touches upon new and different perspectives on the acculturation related phenomenon of immigrant identity. Let me first declare that I have as policy not to comment publicly my sons' and daughter’s writings or cultural production published or shown in the Swedish media, however interesting they are, as I do regard them all. 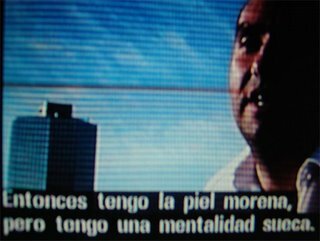 Rodrigo's recent documentary, nevertheless, touch upon some cross-cultural phenomena in the line of themes discussed previously here in this blog. Following, my comments on the documentary "Piel Morena - Swedish eyes" (for sending schedule of the documentary at SVT 1, here). Three Swedish-Chilean young fellows, born in Sweden of Chilean parents - or born in Chile but grown up in Sweden since early childhood - manifest their views on prevalent cultural values and their experiences of being regarded differently, both in Sweden and in Chile. One of the main points being that they are – naturally, because so they have factually resulted by means of acculturation processes in Sweden – different to their Chilean counterparts living in Chile. The interviewed young Chileans-Swedes (or Swedes-Chileans) really impress with their psychological well being, clarity, harmony and integrity. All of them ostensibly proud of their Chilean origin or background. The director of the documentary film is himself Swedish-born and with a family background with mixed roots in Chile, Italy, Germany, and Luxemburg. Sofia says that she thinks as a Swede, even when she is in Chile ("I have a Swedish skeleton and mind"). It became also evident in the underlying psychology disclosed by the interview, that having a Swedish analysis perspective, values, and even point of views, does not bother (perhaps a little bid the contrary) the young immigrants. Most interesting here is that not only Swedish viewpoints are those becoming prevalent inside the piel-morena young- immigrant’s mind, but also the overall psychological “national-attitude”. For example, Sofia declares that she feels sort of guilt. This feeeling may be understood as arising even - or particularly- in front of her Chilean counterparts. Among other because, as Sofía declares, she had got so much in Sweden, such as a fantastic school, "språk", etc. a) She does not regard herself totally as a Swede, and "why would I have had so much, considering that my family is not originally from Sweden?" "Am I entitled to a full-Swede treatment"? one could read behind her lips. The above even in spite that she describes her exile situation as result of a forced migration, and of a political kind. Being her father a former political prisoner and tortured under months during the USA supported military dictatorship in Chile. In this regard, I believe, she has fallen victim of the hyper nationalistic trap, the old discourse that only old Swedish ancestry would qualify for such national identity-share. It is outmost dramatic to observe how a central human right (based in jus solis) is in Sweden deleted among our younger generation. For they have absolutely equal cultural rights - not only juridical - in reference to any other Swedish-born in Swedish soil. b) She lives with the natural and honest impression on that her Swedish way of living, thinking, etc. may be better than the Chileans in Chile, or to a great extent the result of what Sweden ("so much") gives to their youth. But, it this not a bid of European supremacist view? Of course it is not the case of blaming Sofia and the young immigrants for this stand. It is, as I postulated above, pure and crystalline acculturation. One of the essentials, one could say, for an integrated society. Nevertheless, why Swedes would feel guilt in front of "they"? Why would we understand as less desirable the growing up under Latin-American cultural parameters, even if socio-economic indicators would appear (for us in Northern Europe) as not that "developed"? What about the quality of life? The wide-spread national conviction that that Sweden is "best" seems to get deep into the piel morena of their young immigrants and reaching their brain and hearts. Irene. Another main point elicited in the documentary is the view of young immigrants regarding how are they characterized by the Swedish society. 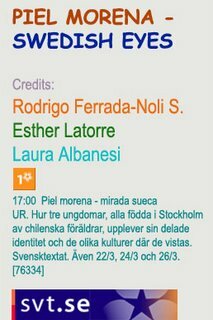 The interview with Irene San Martin, a Chilean immigrant girl living in Malmö is clear and breath-taking. She asks why the Swedes keep on calling her "second-generation immigrant". 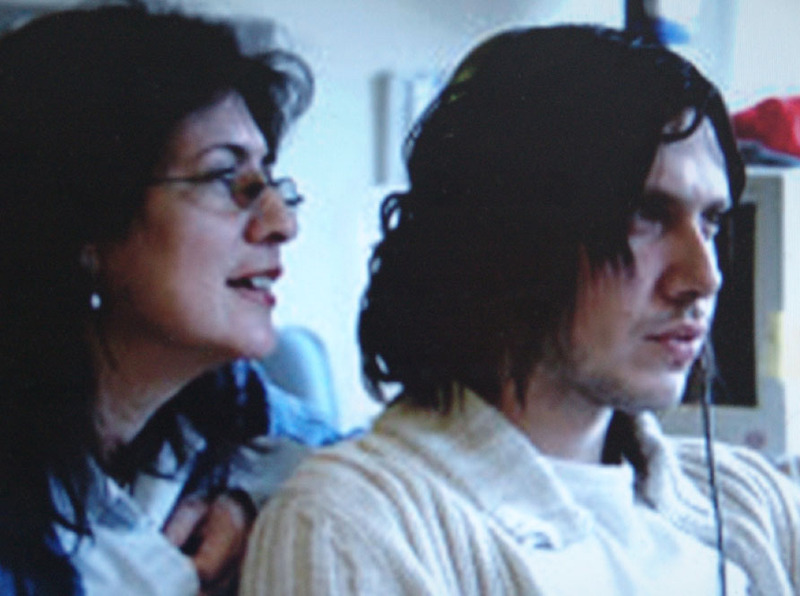 What their children would be called, is a general wondering arisen in the documentary. Will they be called "third generation" and then "fourth generation immigrants", and so on and so for? Just how many years paying taxes in Sweden would be requested from the integrated immigrants of the suburbs, how much sweat and health has to be tributed from the immigrant women, how much hard-work contribution from the part of immigrant workers to the Swedish well-being and welfare would ever suffy, for their children, and the children of their children, to be regarded as SWEDES? The interviewed Rodrigo Avellán takes up yet another very interesting aspect. He tells how his Chilean colleagues actually listen - and are ready to wide their horizon - when he comes with "Swedish solutions" for local problems the Chileans in his branch may encounter. What is the outmost interesting here is not what it is manifestly said in this regard in the documentary, but what surely it comes as immediately reflection by the viewer. Namely, that the Swedes hardly listen at the immigrants at their workshops and jobsites, even knowing that many of these have a well reputed professional background, etc. In fact, many Swedish institutions - structurally - neglect the immigrant manpower and their potential knowledge and aid. In sum, a positive, critical, and very interesting documentary, which has the main merit of invite for analysis and reflection on how Swedes and their immigrants can find yet a better path for enrichment of all cultures, here and abroad. In other words, as documentary films should be. When acculturation ends and alienation begins?